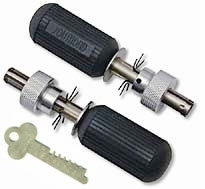 Tubular Lock Pick 8 Pin Sale Knock off another $10! Price too low to advertise. Sale! See actual price in cart! Tubular lock picks are used to unlock many types of vending machines , laundromat machines and some display cases and cabinets. Tubular locks are impossible to pick the conventional way which makes these picks unique. If you lose your tubular key you will need these top quality tubular stainless steel lock picks made by Southord that include a decoder key. The decoder will allow you to measure the cuts on your current tubular lock keys and convert the depth of the cuts to numbers. If a key is lost or stolen, just manipulate the pins on the lock pick tool to immediately open the lock. The 7 pin or eight pin can be ordered separately or you can save some money and buy them both as a set. Coin machine vendors will find these very useful to open many vending machine locks. These are important locksmith tools and one of the best Southord lock pick tools you can get. Buy both together, the 7 and 8 pin, and save money. Lock picking equipment are nonreturnable; we cannot guranty your lock picking skill. Defective items will be replaced within the 30 day warranty period. This equipment is intended to be used by professionals or careful amateurs. The set pins are intentionally thin and must be handled carefully. Light pressure is to be used at all time with these items. Tubular Lock Picks will only be shipped to the billing address of the purchasing card, no exceptions. IE, no dual addresses. Sorry, gift cards, unregistered prepaid cards or International(non-USA) Cards are not accepted.. Orders with these will be cancelled.